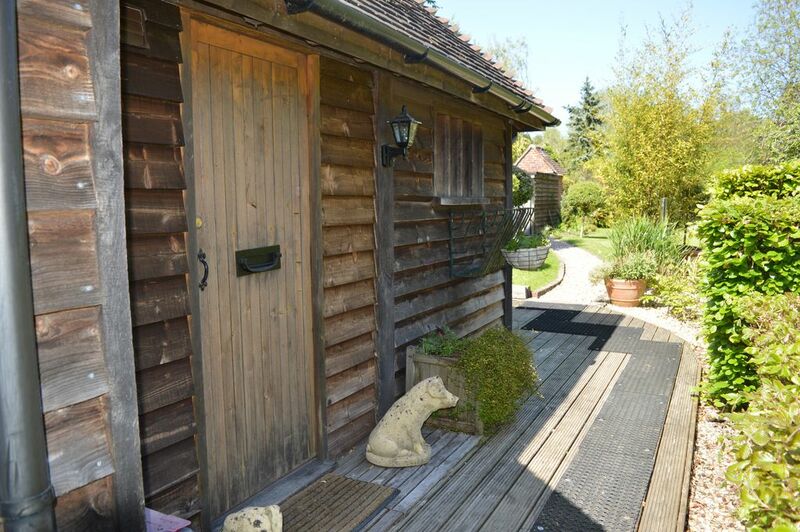 The Barn is set in the landscaped gardens of the owners home nestling in a valley typical of the High Weald Area of Natural Outstanding Beauty and makes the perfect spot for a relaxing break. Accommodation consists of an open plan kitchen/living/dining area, with views onto the garden. Extra guests could sleep on the large sofa bed if needed. The kitchen is fully equipped with a full size hob and oven, a washing machine and dishwasher. The bathroom is on the ground floor and has a powerful shower and heated towel rail in order your fresh towels are always warm and dry. Upstairs in the large galleried bedroom there is a comfortable king size bed with plenty of room for the z-bed or a cot (not provided) if required. Outside guests are welcome to use the garden, sit on the decked area and use the sun loungers. All linens and towels are included in the rental price. Ideally located to visit many of the local attractions such as bluebell railway, Sheffield park gardens, groombridge place and of course all that Ashdown Forest has to offer including Pooh Bear. Plumpton & Lingfield racecourses are a short drive away as is the All England show Jumping Course at Hickstead. Brighton & London are within easy reach with excellent road/rail/bus links. Gatwick Airport is 25mins by car. Walkers, cyclists and horse riders are very welcome. Bring your horse on holiday too, the owners stables and grazing is just a mile away. Permits to ride on Ashdown Forest can be arranged for guests and your hosts have a detailed knowledge of the numerous local bridleways and footpaths. The Barn is in the grounds of our family home, so we are always around to suggest days out and deal with any questions. My husband, I, and youngest daughter, have lived here for over ten years and love this friendly village and beautiful countryside. We have a collection of animals, including chickens providing plenty of fresh eggs for guests. Together with my husbands collection of motorbikes! This is a beautiful part of Sussex and a very friendly village. The Barn is located in our half acre of landscaped gardens. The area has lots of wildlife, watch the deer graze in the fields around you whilst you enjoy a drink. Whilst we are rural London and Brighton are very easy to reach making this the perfect spot to explore the south east of England. Downstairs shower room with wc, hand basin and powerful shower and heated towel rail so your fresh towels are always warm and dry. It is possible to connect a phone for guests who require this service. Calls costs to be covered by guest. Please enquire. Motor bikes or bicycles may be stored in our alarmed garage, please enquire before arrival. Open plan living/dining and kitchen with comfortable sofa and dining table and chairs for four guests. Satellite TV and free Wi-Fi. Overlooking beautiful landscaped gardens. Fully equipped kitchen with full size hob and oven, washing machine and dishwasher. Outside: Set in landscaped gardens, private decked area available with seating. Off road secure parking. Cleaning / Towels / Linen / Maid service: All linen and towels provided. Lovely few days away, fantastic location and the accommodation to match. After a long journey, was lovely to walk into a warm beautiful place, with tea and coffee available and fresh milk in the fridge. All amenities in the kitchen,highly recommended place to stay. Lots to do in the village and surrounded area. Helen and Steve could not be more accommodating. Helen was very welcoming upon arrival. The cottage was really lovely and clean. Fresh eggs and lots of condiments already their. We had a perfect stay. My partner and I enjoyed our stay here. The kitchen was well equipped and was very warm and extremely comfortable. Ideal location for walk and the Bluebell Railway- we would stay again. Great location, easy access to walking tracks and as a hub to Ashdown Forest. Original pub with excellent food within walking distance. Wonderful spacious hideaway, for 4 adults it is on the small side. We would love to return. Well-placed to explore the local area, the cottage is very comfortable with all necessities available. Friendly yet unobtrusive owners made us feel welcome. Bring your horse on holiday. The owners stabling and grazing is a mile away. Permits can be arranged to ride on Ashdown Forest with it's miles of off road tracks. There are numerous local bridleways and the Southdowns National Park to explore. Use The Barn as a base if you are competing at Ardingly, Crockstead, Golden Cross, Firle, Borde Hill Hickstead or Oldencraig all within a 30min drive. There are local riding stables offering lesson/hacking on the Forest. This area is a walkers paradise, footpaths from the front door and the whole of Ashdown Forest to explore. London reached by train from Haywards Heath or East Grinstead main line stations within 60mins. Gatwick 25 mins, Brighton 30mins, Dover 90mins, Lewes 20mins by car. Whilst we are on a bus route (Metrobus 270) a car is recommended. Haywards Heath 5miles, East Grinstead 5 miles. There is an excellent traditional local pub within a short walk. The Coach & Horses serves cask ales and award winning food. To be recommended. Booking Notes: Rate of £80 per night is based on two guests, additional guests charged at £15 per night. Please contact owner. 50% deposit required on booking, refunded in full if cancellation received one month before arrival. Payment in full required within a month of arrival. Changeover Day: Flexible on arrival/departure times and days.